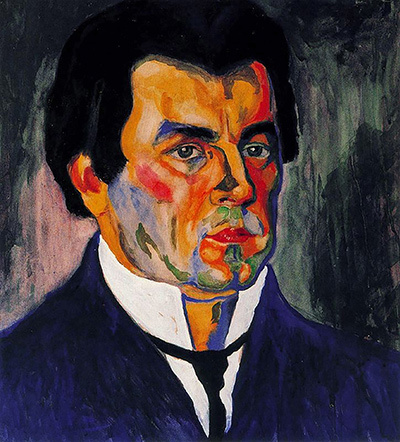 Kazimir Malevich is a Russian painter from the 20th century who was at the forefront of abstract art as it appeared for the first time across Europe. The Soviet Union produced many key contemporary artists during this period despite the culture of the ruling party being relatively traditional in thinking. Some of these Russian modern artists were forced to leave the country and ply their trades in Western Europe or the United States in order to enjoy better opportunities for their careers. Kazimir Malevich was part of the Suprematism movement which formed a collection of artists involved with in the overall umbrella of abstract art. Black Cross and White on White were two of the better known abstract works from the artist and also amongst his most abstract of all, working down to exceptionally minimal shapes and also colours. There are other paintings, included with in this website, which are less minimal and these may suit different tastes, such as Red House, Three Figures and Englishman in Moscow. Kazimir Malevich originals have been sold in recent years for some extraordinary prices, up to $60m dollars, driven partly by the excitement for abstract art generally but also with the amount of money floating around some parts of Russian society who are looking to retain the key cultural elements of their history. Strictly, of course, Malevich would be classed as Ukranian by today's borders, and that explains partly how the Soviet Union contributed so many significant artists from the 20th century, even though many had to leave the country to make the most of their skills. Kazimir Malevich created Black Cross and this was a shockingly abstract piece which was always likely to cause controversy when it was first completed. Abstract works often require an understanding from the artist as to what it represents in order to appreciate the piece where as more traditional art is often much more immediate. There are similarities between Malevich paintings and those of other Geometric artists such as Piet Mondrian who came from the Netherlands and also chose an abstract path. He did not quite reach the same levels of abstraction, though, and relied on a greater use of colour than say Malevich had done in his Black Cross work. Kandinsky was another abstract painter who used geometric shapes to form his compositions but went again for far much more detail as well as a greater variety in the shapes and colours used. Kandinsky himself also came from Russia and so the path he took through his career was very similar to that of Malevich. Whilst this artist came during the early stages of the rise of abstract and modern art, there were many more variations which followed across the 20th century and many more continue to appear all the time. Cubism was one of the significant movements to appear and was contributed to by Juan Gris and Pablo Picasso. Kazimir Malevich paintings were later accepted by controlling powers in Russia as Malevich had correctly predicted but it did not happen until many years later after changes in the leadership of the country had occured. It is only in recent years that the artist has been seen in Russian exhibitions despite his popularity across the world, this seems to suggest that Russia was a little behind the times at the top, but still managed to create innovative artists who found a way to draw attention to their new ideas. There has been all manner of other movements too, including Installation art and Digital art and even with in them there are plenty of new off-shoots which also provide interest and potential inspiration for future creative artists. In truth, no other artistic umbrella as modern art has contained a wider variety of styles and Malevich helped contribute to the whole thing with his early 20th century abstract paintings. At a later date the artist was to become involved in aerial art, which involved thinking about depictions from a top-down view. Mondrian demonstrated this at a later date with his own abstract paintings, such as with Broadway Boogie Woogie which depicted New York City from a bird's-eye view and converted each significant object into a simple geometric shape, such as with taxis being yellow squares. It is fair to say that Russian Kazimir was really innovative and also very happy to try new things with in his career at all times. Some painters have become contented to stick with one style which has proven popular but he was someone who really wanted to take his own skills and ideas just as far as they could go. In the long run, those who take their skills into new avenues will normally achieve a greater respect from academics. Suprematism is a specific art movement which is believed to have been set up by Malevich in the first place, partly by his art and also partly by his artistic theories which are still available in print. Black Circle and Black Square, plus White on White as mentioned elsewhere in this website, are the best examples of the shear simplicity involved with this movement which flies in the face of everything that happened in the art world up to the 20th century. Suprematism itself refers to the supremacy of the artist's feelings straight into the art work, without any desire whatsoever to represent them as real life things which we all can identify with, such as landscapes, portraits and so on. This unusual thinking was controversial then, and it remains controversial today, although the spread of art fans following abstract and traditional work has changed considerably and many art fans can be considered to be fans of both. Malevich's approach became unpopular with the ruling powers in Russia into the 1920s and it was necessary for him to take a lower profile for several years during that time, in order to avoid the institutions which he represented becoming targeted yet further. He was able to stay relatively out of trouble for the remainder of his career although he was less vocal in his criticism of Government-backed artistic styles which he himself detested. There is a long history of innovative artists going up against institutions who preferred much more traditional art. Some of these artists have found it necessary to leave the country in order to continue their work without interference, sometimes even fearing they will be attacked or imprisoned due to the content or style of their work. Others have actually embraced the situation and used it to their professional advantage, such as with Delacroix who was involved with key political elements during his time and this offered him greater opportunities once he had become an "approved" artist. Black Cross is included above and is one of the most abstract works, with very clear geometric lines that are undeniably an example of the Suprematist movement, of which this artist was such a major part. Several artists in recent years have been very strongly opposed to tradtional art which, as they saw it, was stale and not to their liking. Quite simply each one went about creating new forms of art, as seen with paintings like the Black Cross, which they believed could eventually become as popular as more traditional styles like the Renaissance. White on White links closely to Black Cross in that it marked the height of the artist's level of abstraction. It is difficult to see any artist creating something more abstract than White on White which features exactly that, and would have proved hard to promote at the time that the artist first created it. It is also paintings like this which even art fans in the present day often have a hard time in understanding as to where the skill and innovation sits, even though this approach has been around since the time of Malevich. The artist produced a book entitled From Cubism to Suprematism which outlined his views and ambitions for much of modern art and this links closely to the art theories to have come from Kandinsky who himself found in great depth about the direction of art, rather than simply concentrating on his own particular work. Many mainstream art fans see the simplicity of the technical side of abstract art and don't see as far as what lies behind them, which can often involve a surprising amount of thought. Malevich took on strong competition from other Russian artists as well as political forces in his country who themselves disapproved of all such work and yet he still managed to leave a great legacy which many still continue to enjoy today. You find examples of the art discussed here in many people's homes, be it from Kandinsky, Mondrian or Malevich himself. The simple fact is, modern art is now here to stay, and is developing all the time too. There are some incredible art collections now in Russia or owned by Russians for several reasons. There were several forward-thinking art collectors from this country who bought up much of the best modern art throughout the 20th century and much of this was passed on to national galleries. There were also many key artists from the country, with some of their work inevitably still being in the country too. In recent years there have also been some exceptionally rich businessmen to have appeared from Russia and some have used spare cash to buy some of the most significant and expensive European art going. Russian artists have provided us with so much during the 20th century and offered forward-thinking ideas which suited the modern art which came out during that time. Malevich was just one of those and many went onto America or Western Europe where they found a greater openness to new ideas and innovation with in art. Each artistic era has been dominated by specific countries and Russia certainly came to the fore in these abstract styles, as France had done with impressionism and Italy during each stage of the Renaissance. All of the best paintings from the artist are listed here and each links through to the Art.com prints gallery where all of them are available to add to your own homes. We use them regularly and also receive a small commission from any purchase that you might make, which helps towards the up-keep of this website. Their gallery covers the full career of Malevich and his prints are very frequent chosen for modern art fans, with his minimalist, abstract style perfectly suited to most modern homes where there is less clutter and a need for some simple lines and colour from any art. The gallery provided here is a great way to quickly understand the qualities of this artist and the styles which he used within his work. There are many more to see from the links provided, with all of his best work covered by Art.com who provide an excellent selection of prints ready to buy online, with thousands of other artists included as well. Kazimir Malevich offers us an interesting look into abstract art but this homepage only includes a brief set of his best work, and for a more comprehensive list of his career output, please see the list below.